This gaming season has been a good one for co-op gamers. There are lots of AAA retail titles that just might be sitting under your Christmas tree, Menorah, or Festivus pole right now. A few inexpensive, small downloadable games featuring co-op have recently become available in Xbox Live's Indie Games service. In between long sessions of those big titles, these little co-op stocking stuffers are the perfect fit. All of them have demos, too, so go ahead and queue them up! Dual Zone - This one is a bit hard to describe. Players control spaceships floating in a metal arena, and have to dodge enemy UFOs trying to collide with them. 50 levels and 2 player co-op are included. Full game is 240 MS Points. Wool (pictured above) - Not too many games let you play as sheep dogs, but Wool does! 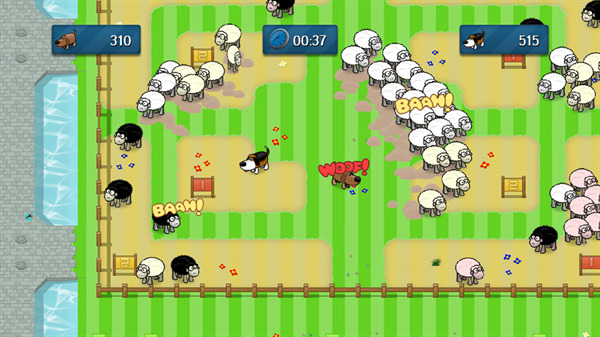 Up to 4 players team up to herd the sheep in the right direction through 30 levels. Full game is 80 MS Points. Storage Inc. - Players use forklifts to move boxes into the right areas in a warehouse. Four players and 50 levels, all with co-op support. Full game is 400 MS Points. Page created in 0.6794 seconds.